I was so excited to partake of supper. I’m more of a seafood and poultry diner. However, once in a while I like to indulge in a succulent piece of beef. Had the craving for same and went with the chunk portion of same. Chuck steak is relatively inexpensive compared to filet mignon and takes a longer time to tenderize. I fetched a pack with three portions for $5.99. Chuck was marinated overnight with salt, black pepper, crushed garlic, fresh thyme, and balsamic vinegar. The vinegar acted as a tenderizing agent as well as providing a brown hue along with flavors. 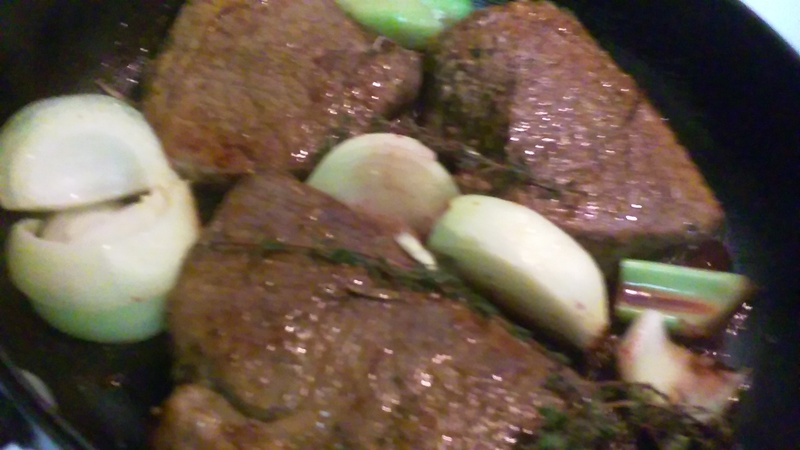 Steak was brought to room temperature; then browned on both sides in a drizzle of olive oil. I used a half cup of Cabernet Sauvignon wine to de-glaze skillet. Roughly chopped onions, and celery were added along with fresh thyme, and rosemary. Also, a squeeze of ketchup and a pinch of sugar were added. Fresh tap water was added and lid placed on skillet. 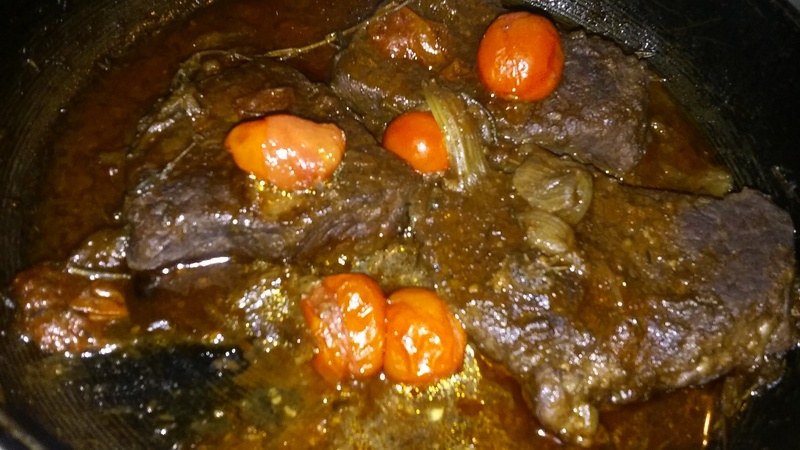 Steak simmered low to medium heat for approximately 80 minutes until fork tender. Additional water was added when needed. A few grape tomatoes were tossed about five to seven minutes to end of cooking time. The root veggies released all their delicious flavors and juices and enhanced the taste of the steak. Served up chunk steak with roasted carrots and a herbaceous helping of red-skinned potatoes which soaked up all the amazing flavors. The steak kept its shape but was fork-tender and succulent. A fresh serving of spring green beans gave the dish a contrasting and crispy taste. While the red and sweet grape tomatoes used to top steak popped and excited my taste buds. Me and my palate were super-happy as we sipped on Cabernet Sauvignon.